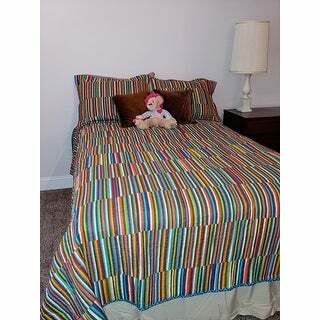 The colors are vibrant and the quality is great on this quilt and sham set. They brighten a closed in garage room that we just had redone, and have so many colors they go with almost anything. Very happy with this purchase. Taos Quilt Set The Taos Quilt by Fiesta uses the bright Fiesta Colors in a unique offset stripe. Reverses to thumb sized blue and turquoise diamonds. This quilt set is made of 100-percent cotton, cotton cover and cotton fill. Will brighten up any room. Coordinating Fiesta decorative pillows, sold separately, finish the room. A very beautiful quilt with vibrant colors which Fiesta is know for. I like this quilt set because it is lightweight for summer use but still warm enough for cooler weather. I also like that there are many colors in the quilt so I picked one out and accessorized around it. The quality is very good and I got it on sale so I'm very happy with my purchase and look forward to using it for many seasons to come. P.S. My mattress is extra thick and the quilt covers it very nicely. Nice, like the zippered pillow shams. This bedspread was purchased for a master bedroom that needed some color. This was a perfect choice! The colors are vivid and true to the photo. Very nice quality. I just love this set ! When I put it on my son's bed , the whole room lit up. Good quality is put into making this quilt. AND it's so beautiful and it makes you happy when you come into the room ! The color me on the striped side are not bright. It looks dirty. The blue side, shown on the picture as the inside is really cute and I’ll be using that side and keeping the quilt. The quality is medium. Colors are vivid and will make any bedroom a very happy place. Bought the queen size and it covers well.Not too short on the sides like so many others. You will need a bed skirt. The colors weren't as bright and crisp as shown. The main problem though, was the stitching was ripped in several places and a large piece of the edge binding was torn. I probably could have fixed it myself, but for the price I shouldn't have to do that. We enjoy the service and quality we receive from Overstocked.